Home > Personal Details > What is Text Messaging Identity Theft? Text messaging identity theft is a relatively new scam that more and more people seem to be falling for. Also known as "smishing", it is a new form of phishing that enables fraudsters to get their hands on your money even quicker than they did in the past. Much like the stereotypical email phishing scam, these smishing fraudsters send out a text claiming to be from your bank. Of course, a small population of people receiving the text will actually have an account with that bank, so will fall for the scam. The bogus text will say that the bank has noticed a problem with your account, and that to rectify it, it needs specific information, such as your name, date of birth and address – and sometimes even the password to your bank account. Once they have effectively stolen your identity, they then try to either empty out your account, or go and get credit cards in your name. Then, not only have you lost money, but your credit history eventually will be hurt, once they make big purchases in your name. Harvesting unsuspecting members of the public for their personal data for fraudulent purposes is nothing new. But while people are on alert for email phishing messages, often they do not recognise a text message smishing scam. Spam filters exist on computers to get rid of fake messages before they reach you, or to alert you to fake ones. Such filters do not exist on mobile phones. 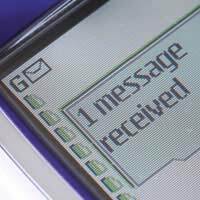 A bogus text can be considerably shorter than an email. If an email is full of misspellings and mistakes, you may notice something is not right. You may notice nothing with a brief text message. Many people are unaware that smishing exists, so may not be as alert as they should be to a possibility of a text message scam. You receive a text message warning you about a charge that has appeared on your bank account, one which you can cancel only if redirected to a specific website. When you click on it it asks you for personal information. You are asked to call a freephone number to cancel a financial transaction. When you do, the person at the other end of the phone asks for your bank account information. A text is sent asking you to reconfirm your bank account and PIN number, as fraudulent activity has been noticed. If you do not do so immediately, the message says, your bank account will be closed or suspended. Never respond if any text asks you for personal information. Never click on a website a text message asks you to click on. Always delete texts from your phone which you feel may be bogus. Always check with the person directly – by calling your bank branch, for example – to see if the text is real. Never call any unknown telephone number that is provided in a text message. Never give out personal information on the phone. If you are not sure your bank is the one actually calling you and asking for information, for example, then call them back using a number you are familiar with to supply the info. Identity theft is becoming more and more prevalent, and mobile phone smishing is just one of the latest way unscrupulous people try to get access to your money. You have the power to foil their attempts, however, by taking sensible precautions to safeguard your personal information.